At the age of seventeen, I considered a career as an actor. I think it was more about expressing myself than acting though. 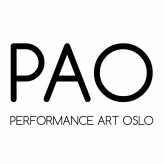 I started studying visual arts at SHKS Oslo from 1990-95. It was natural and on the spot for me to participate at performance workshops with Hilmar Fredriksson, Kurt Johannessen and Kjetil Skøyen as teachers. Dadaism and Fluxus felt like old fashioned and established forms. I felt the urge to express myself and break my own inner limitations. I searched for freedom and liberation from my own and maybe others conventional behaviour. As well as psychological and mental limits like insecurity, fear of others and the ways we have learned to think and behave from our parents and the society around us. I wanted to find something beyond all this. I think I wanted to find myself and understand what life is about. I play freely, follow my ideas and emotions, subjects that I feel are important for me. I can get images and ideas whilst I listen to music. I want to break with conventions that exist in my mind as an artist and those which exist in the art scene. How I/we unconsciously or consciously feel performace “should be”. I distanced myself from Dadaism and Fluxus and have done performances as if I was doing stand up, a lecture or a rock concert. It has been important for me to have the courage to practice freedom of speech and to keep my mind free in order to be able to follow my inner visions. I have been improvising a lot within a few frames. The audience and the situation create the final end result. I do all art forms. Performance has had a very important role for me as a person and as an artist. The novel I wrote, “Jeg elsker sol” has been a source of performances since 2001. At the moment, motifs from my drawings/paintings are coming into my performances. I worked with mentally disabled. A young women became an inspiration to me. She would freely say and do things that created remarkably unusual situations. She would feel ashamed afterwards, but she still did what she wanted or had to because of her state of mind. I got this idea to behave like her, freely, unlimited and without shame in my performances. Q: How do you experience or consider the audience / surrounding? What space / surrounding do you find interesting to work in? How does your surrounding influence your work. Do you involve the public? If so how? I adapt to spaces and get inspired by the audience. I am in contact with them, talk, ask questions or react if something happens in the audience or in the space. Nothing disturbs the performance, but instead helps to create and shape it.